All skin types. 99% Organic. No EDTA, mineral oils, parabens, synthetic fragrance and colours or silicones. Non GM.Nurtures and revitalises all skin types. 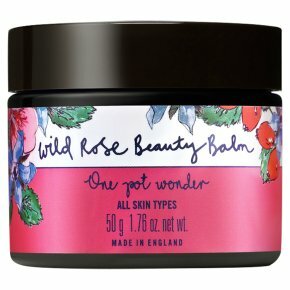 Award-winning Wild Rose Beauty Balm can be used as a rich cleanser, gentle exfoliant or deeply nourishing balm - to quench areas of dry or dehydrated skin. The exceptionally high levels of wild rosehip oil - a potent antioxidant proven to help repair, firm and smooth the skin - are combined with geranium, starflower, hemp and rosemary oil, to help decongest and enrich the skin, restoring its natural radiance.